Sony develops AirPlay wireless speakers and dock | What Hi-Fi? It's all been about wireless music streaming today at Sony HQ, with the company revealing its first yet-to-be-released AirPlay speakers and dock. 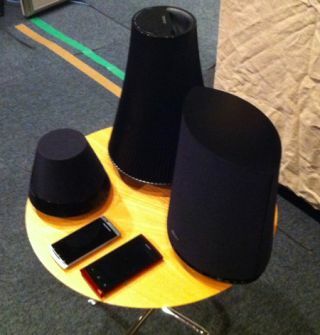 There are three wireless speakers in development: the NS310, NS410 and NS510. All feature wi-fi, DLNA, AirPlay, 360 degree sound and built-in digital amplifier. The firm says it didn't use Bluetooth for wireless streaming as it's very power hungry and drains the battery on portable devices too quickly – none of the NS speakers have a charging dock. The largest model, the NS510 (middle top), has a rechargeable battery that gives up to five hours playback. The other two are mains powered. Although Sony's engineers are still fine-tuning the sound, we were given a demo of the NS510 model. Music was streamed from an iPad using Sony's bespoke Network Audio Remote app which allows you to select the music service you want (in this instance, internet radio) and stream it to the speaker. You can also stream iTunes music from any iOS device using AirPlay, and Sony demonstrated music streaming from its own Tablet S, again using the company's Network Audio Remote app. In the latter case, you can stream music to multiple Sony NS speakers, unlike with AirPlay which only allows you to stream from one device at a time from an iPhone/iPad. As the NS AirPlay speakers don't have any kind of display, Sony says it's working on wi-fi set-up apps for Android and iOS devices. We also saw a prototype AirPlay micro hi-fi system with CD player, wi-fi, DLNA and DAB+ radio. Launching in April is the Sony RDP-XA900iP wireless iPod dock (above). Aimed squarely at the likes of B&W and Philips, it has AirPlay and Bluetooth wireless tech, an S-Master digital amp, magnetic fluid speakers and dual passive radiators. There's an aluminium top-plate to give it a premium feel, and Sony's sound guru Eric Kingdon says he and his team "worked really hard to project the sound out from the dock and not make it sound boxed in like other systems. "We tuned it to sound like a proper hi-fi product, with the correct tonal balance, good timing, proper rhythm and deep bass," says Eric. And as a sign of his confidence, Eric did a demonstration of the XA900iP in direct comparison with the Award-winning Geneva Model M dock, playing Hotel California and Adele's Someone Like You. "Anyone can make a sound dock, but making it sound good is the real challenge," says Eric. UK pricing for all the models we saw today has still to be decided.